Availability: Temporarily out of stock, Please email us or call 1-855-296-9508 for further information. finally a CO alarm that looks good enough for your living space. Innovative Low Profile – Fits in most standard 2-gang, metal or plastic electrical boxes. 120V AC Direct Wire, Sealed Rechargeable Battery Backup – Interconnects with up to 24 Kidde devices or 18 initiating alarms. Protects continuously, even during a long-term power outage. Sealed battery does not need to be replaced for the life of the alarm. Backlit Digital Display – Blue digital LED display alerts you before harmful levels are reached. This unit updates the CO level reading every 15 seconds. Peak Level / Test Button – Peak level memory button recalls the highest recorded level of CO since the last reset. Test/reset button tests CO alarm circuit operation, and allows you to immediately silence the alarm. CO and Smoke Alarm Indicators – If this unit is interconnected with other Kidde CO alarms, and has detected CO, the amber LED (Initiating Alarm) of the unit will light for the duration of the alarm. The other interconnected CO alarms will also alarm to warn you that CO was detected. 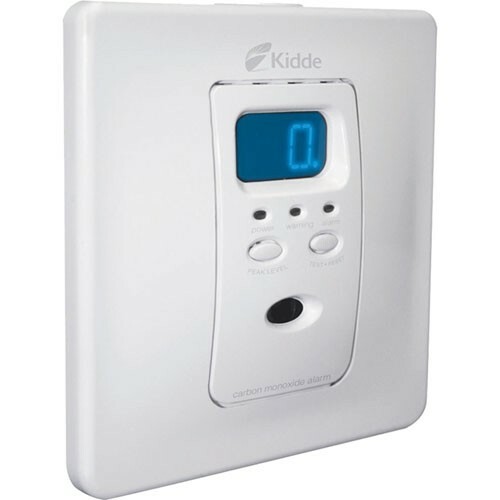 When an interconnected Kidde smoke alarm detects smoke, the Kidde CO alarm will sound a smoke/fire alarm pattern.